At GenCon this year, I had the opportunity to meet a delightful mommy gamer named Naomi Tripi, and just the other day, she mentioned that she had a Kickstarter going on! She’s developed a game called Flip Flash and wants to share it with the world. Flip Flash is a card game Naomi created with her cousin when they were children. Over the years, the game has been tweaked and perfected, tested by industry professionals, friends, and Naomi’s own autistic son. Naomi hopes the game will bring parents and children together, and also that it will serve as common ground for kids to play with their differently-abled friends. 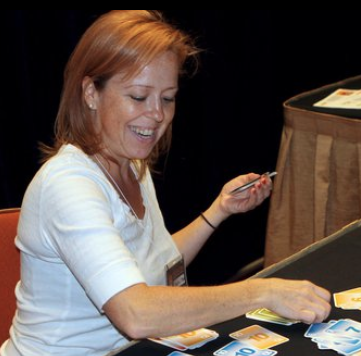 To play Flip Flash, players simultaneously flip through their cards and race to play them on shared number piles in the center of the table. The first card to the pile gets to stay. You can play a number higher or lower than the top number on a pile at any time, and only the color has to match. If you play a WILD card, you can change everything about the pile to suit you; simply yell out the color and number you want the wild card to represent. When you’ve played all the cards in your down pile, you can yell “Flip Flash” to end the round. Scoring is +1 for every card played, and -2 for every card remaining in your down pile. I hope you’ll help this inspiring woman achieve her dream of making this game a reality. Head to Kickstarter to support!